So what is “Cheeriodicals?” In short, it is what happens when you use magazines to spread cheer among people. No wonder then, when I heard about this company, I reached out to its founder and president Gary Parisher and invited him to come to the Magazine Innovation Center at The University of Mississippi to sit down with me for an on-camera in-depth Mr. Magazine™ Interview. The genesis of Cheeriodicals began when the company started distributing magazines in “Tiffany-styled” green boxes to sick folks in hospital beds, and later expanded it to children in hospitals, and to individuals celebrating an event and even corporations sending good wishes to their clients and customers. This is a “TIME” moment where a picture is worth a thousand words. 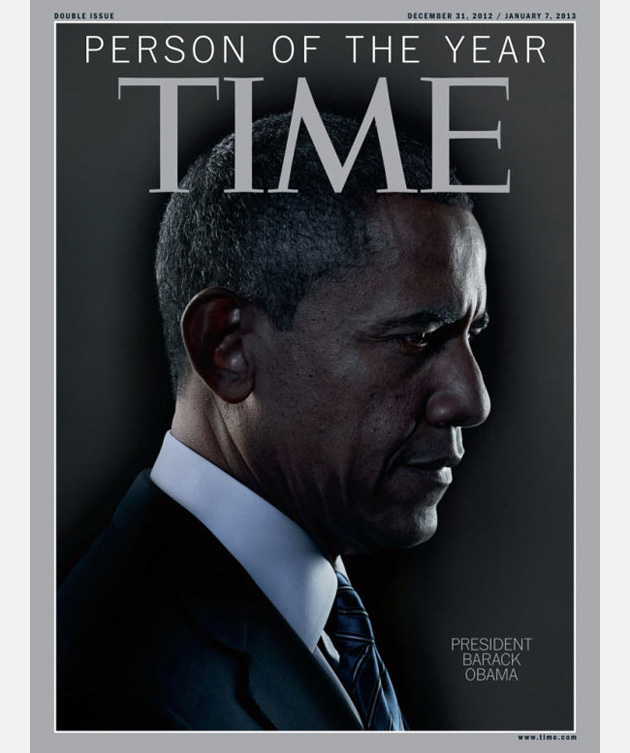 The image of the president on the cover of TIME. 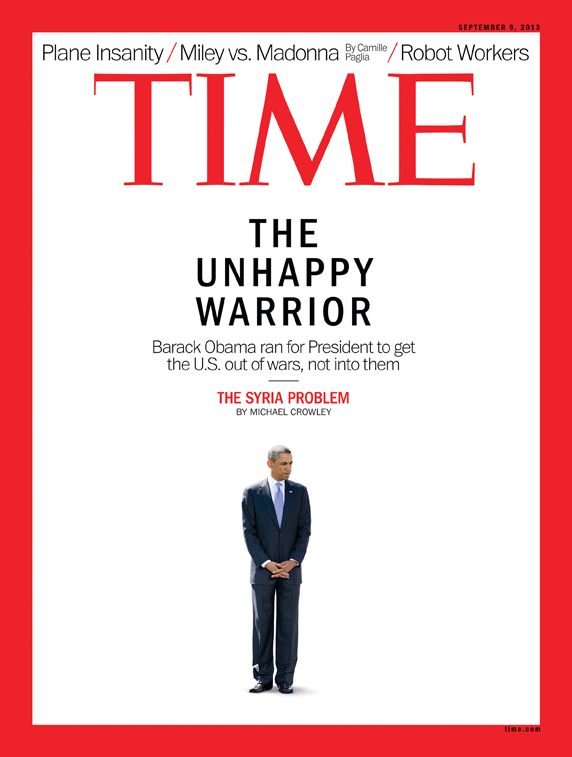 From the Person of the Year to The Unhappy Warrior. That’s all I have to say about that! For the ends of Harper’s Bazaar and ideal Vanity Fair. Most quiet need, by People StyleWatch and Marie Claire. I love thee purely, as they turn from Cosmopolitan tales. I shall but love thee better, New York Magazine, after death. Yes, I realize I owe Ms. Barrett Browning (and my assistant Angela) an apology for taking liberty with her classic poem (and helping reshape the poem), however, the sentiment is oh-so sincere. September brings about the hint of autumn, the singular flutter of a yellowing leaf to the ground, depending upon where you live; I live in Mississippi – hence the singular flutter, splashes of oranges and yellows from the pumpkins and fall squash in the markets. But most important in the world of magazines (ink on paper that is) and magazine media (everything else)– it is that time of year when the crème-de-la-crème of publishing rise to the top with their most extravagant issues of the year. And for most, September 2013 is offering their biggest editions ever. It’s a celebration of fashion, football and the fall season. 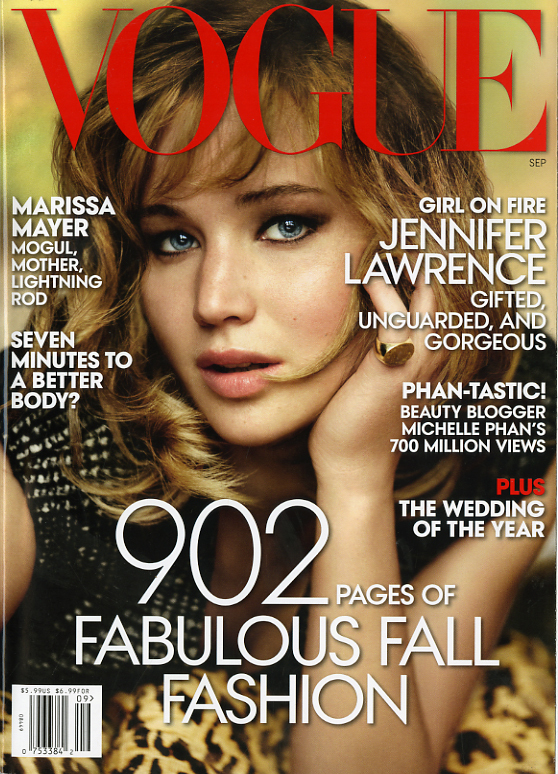 Up first and weighing in at a hefty 902 pages is Vogue. This issue is synonymous with evocative style, beauty and fashion, as only Vogue can do. The content of the magazine is chocked full of visually liberating ads that transport you into a world of haute couture that is both extreme and exhilarating. Anna Wintour’s letter from the editor begins on page 276, just to drive home the image of the magazine’s thickness in one’s mind. Totally amazing. 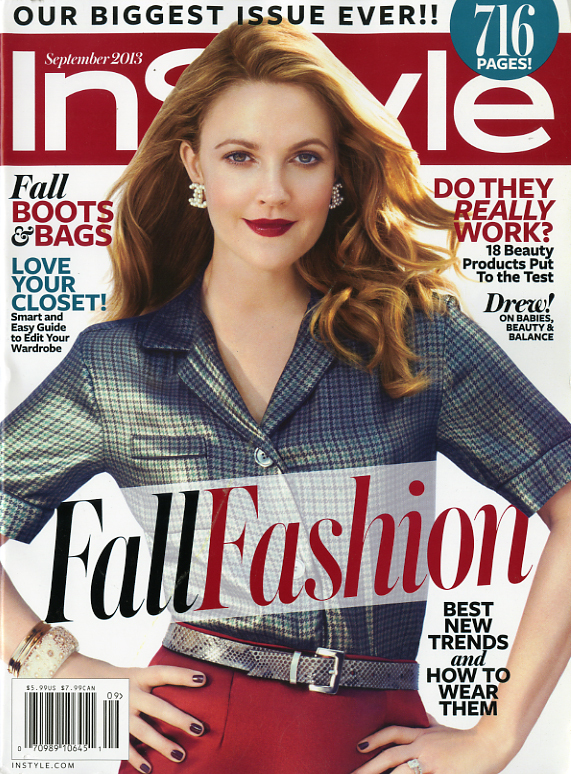 InStyle shows off their “biggest issue ever! !” – two exclamation points. 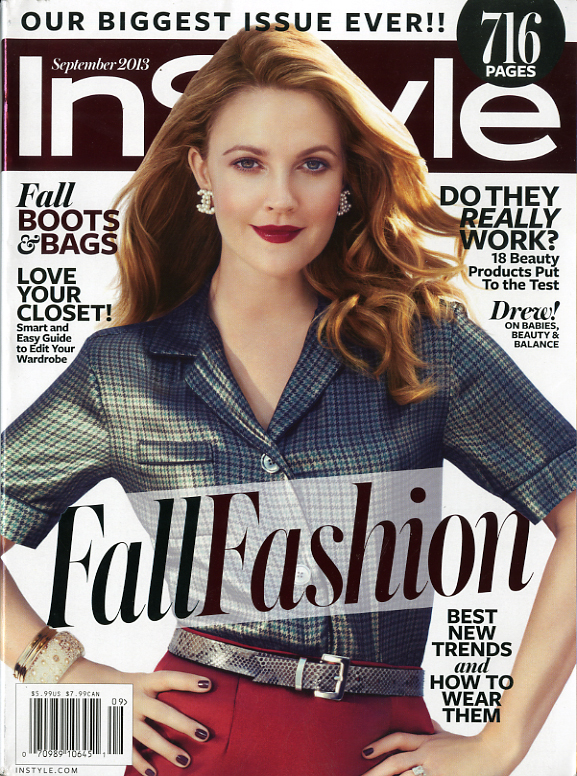 716 pages of fall fashion. ELLE shouts to the world: “Our biggest fashion issue ever! 650+ pages” – with a curvaceous Kate Upton receiving the cover’s hello. 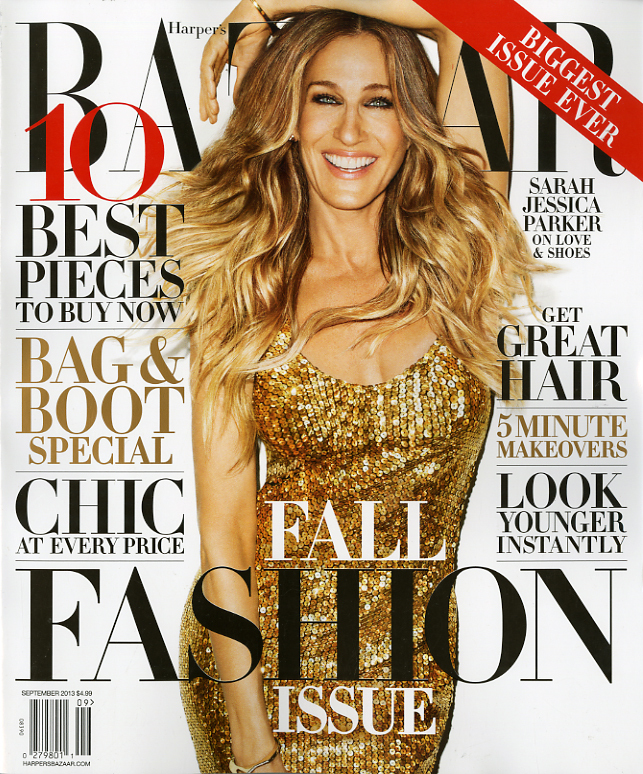 Not to be left behind, Harper’s Bazaar proclaims “Biggest Issue Ever” with 598 pages of fashion fun. You’ll find Editor, Glenda Bailey’s letter, on page 206 and in her own words the proud declaration: “Our September Issue, the largest issue in our history.” Certainly, something to exclaim about. The fall fashion issue of W flaunts its oversized beauty proudly with 454 pages of chic. Marie Claire comes in at 428 pages and looks marvelous doing it. Glamour, as “glamorous” as ever with 386 pages. 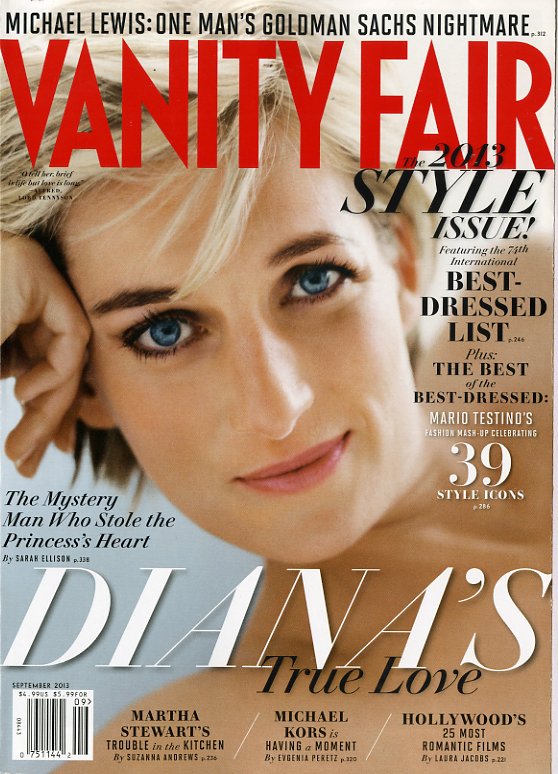 Vanity Fair is 362 pages of style, featuring the 74th International Best-Dressed list and a dead celebrity on the cover. Cosmopolitan shares their always entertaining “tips and advice” between their 264 pages. New York Magazine features 208 pages in their fall fashion double issue – and is very noteworthy because the fashion model is sporting a barely-there design (a tattoo) made in collaboration with Marc Jacob’s tattooist – which happens to be the model’s husband. 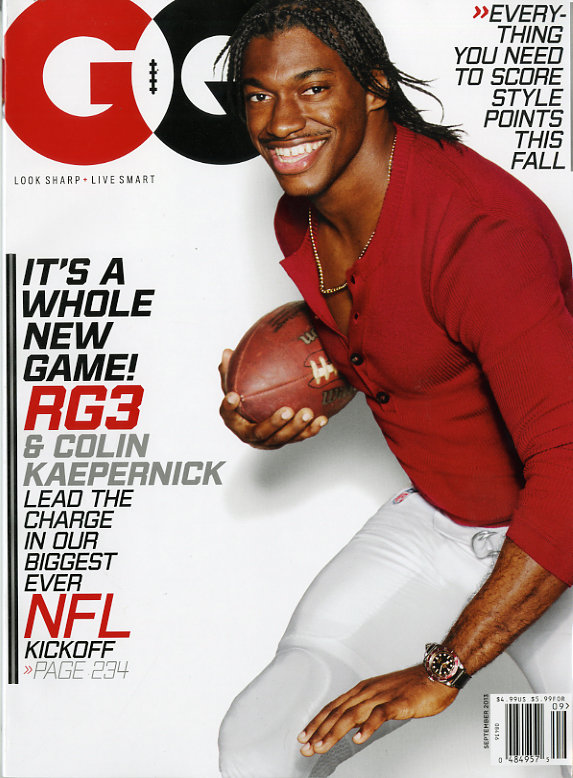 And in the men’s world, GQ comes in with two different covers giving a shout-out to their biggest ever NFL kickoff with 296 pages. The fashion issue of Details uses 234 pages to tell guys how to look great this fall. And Esquire has 216 pages with their biggest style issue, featuring Thor himself – Chris Hemsworth. So what does all this mean? Simply that print magazines still anticipate the seasons the same way we humans do. In fact, it might be fair to say, we anticipate the seasons because of those special magazine issues. With their lush, overflowing-to-the-hilt content, I really can’t think of a reason not to. So, to September…how do I love thee? Let me count the magazines – and the pages! If only the solution was that simple. But like a tough nut, there’s are many layers to the issue that must be cracked, peeled away, before the real meat is revealed and relished. And with this article, I think we’ve been doing that, peeling away the layers, one at a time. All of the industry veterans quoted in this article have their own experiences and track record to back up their opinions and perspectives. We must take these, along with the thoughts and ideas of many others, and like a jigsaw puzzle piece them together so that the picture becomes clear and comprehensible. A recent panel discussion at the MPA/PBAA Retail Marketplace brought together top magazine executives focused on retail channels. They all agreed on the importance of these channels and discussed their views on how to stunt the decline in sales, while maximizing the potential and profitability of the print product. Chairman and CEO of the Meredith Corporation, Steve Lacy, pointed out that Meredith’s recently acquired all-digital brand allrecipes proved quite popular. Approximately 25-percent of the 25 million unique visits per month were generated right in store aisles, as shoppers looked for recipes and ingredients information. As a test, Meredith took one of its food special interest publications and put the allrecipes logo on the cover. This yielded a 40% retail sales lift, Lacy reported. Condè Nast’s President, Bob Sauerberg, encouraged a “getting together” of the powers-that-be. Skip Zimbalist, chairman and CEO of Active Interest Media (AIM), agreed that retail will continue to be vitally important. 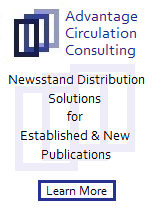 •	Bring the major components of the newsstand: publishers, national distributors, wholesalers, and retailers together in a collaborative effort to grow sales. So what do you think? Can we save the American Newsstand? Let me know what you think and stay tuned. Newsstand sales exceed $3 billion, and magazines are sold at more than 100,000 retail spaces across North America. Single-copy magazine sales are critical to the industry’s future prognosis. The newsstand, in its many retail manifestations, often provides insight into trends in magazine sales and how to best target magazine readers. The picture, however, is often bleak. Joe Berger of Joseph Berger Associates, a circulation marketing and consulting firm in Chicago, agrees with Harrington: “The present status of single copy sales in the U.S. is, at best, tenuous.” Much analysis about the declining vital stats of newsstand sales has revealed numerous contributing factors, and left publishers pondering if the trends are irreversible. Everyone from CEOs to copy editors can cite causes for the newsstand’s declining health, but few offer viable remedies. Yet a close look at some of the crucial issues related to newsstand sales points the way to a brighter outlook. Luke Magerko is a 20-year publishing industry veteran who spent a number of years at Meredith Corporation and with wholesaler Independent Direct Distributors before his venture into the publishing arm. Most recently, he founded The Market Analytics Project, which compiles and interprets actionable data analytics for publishers, vendors and retailers. The contemporary newsstand climate is “bleak,” according to Magerko. 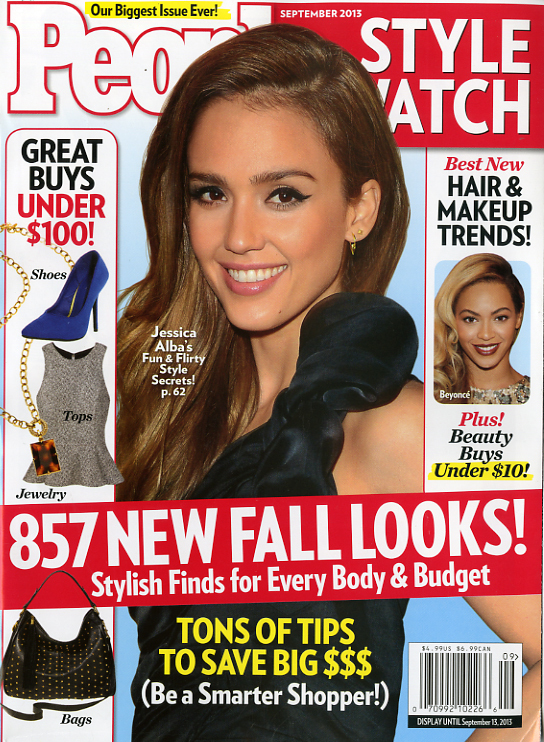 “Retailers are reducing in-store magazine space due to rapid sales declines. Wholesalers continue to add small fees and adjust terms and conditions in the hope they can generate incremental revenues at publisher expense. Lastly, newsstand departments, national distributors, and consultants avoid industry challenges by blaming outside forces such as the debilitating 2008 recession and the Internet,” he confides. And Magerko concurs newsstand marketing needs an overhaul. “Checkout space is not being utilized to its fullest potential, and I believe there are specific titles, categories and formats not being represented. There needs to be a new mix at the checkout,” he explains. Gil Brechtel is President and CEO of MagNet, which provides critical sales and marketing information to the publishing industry. As the man with his forefinger on the pulse of the industry’s newsstands, Brechtel offers particular insight and hope. There’s also a big question of mobile blinders – the phenomenon by which consumers are involved with their mobile devices while standing in retail lines. This is time that used to be spent perusing magazine covers. Brechtel strongly believes the industry should work together more collaboratively – publishers, distributors, wholesalers, retailers – to glean new ways to drive sales, and not solely focus on cost reduction. “Publishers need to reestablish their role in the supply chain and within their own newsstand departments,” suggests Luke Magerko. 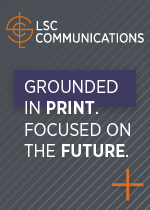 “The publisher is the second most important player in the supply chain behind the retailer. However, they have ceded their authority almost completely to members of the supply chain.” But publishers must remain diligent about the quality of the product they’re increasingly worried about disseminating. MPA’s president and CEO Mary Berner has faith in the future of magazines – whether they’re distributed in print or electronically, as part of a subscription, or by way of a supermarket check-out line. * The above article is a reprint of my article that appeared in the July/August issue of Publishing Executive magazine. A fair question: Are the innovations in the single copy sales of American magazines keeping up with the pace of the innovations in the electronic field? A fair answer, from a man who wants to save the newsstands, Luke Magerko, is a resounding NO. So, in this third part of my interviews with Luke about the newsstands I decided to look at a growing industry on the periphery of publishing. Working with Luke, we assembled a simple timeline of major innovations in personal digital assistants (remember those?) 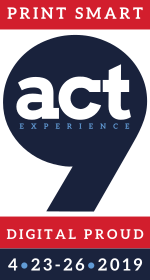 since 2000, focusing on the Blackberry, the smartphone, iPad and touch screen devices. These devices dominate our world and have legitimately decimated some and impacted other magazine categories, if not all magazine categories. (See the list at the end of this blog entry). SO MY FIRST QUESTION TO LUKE WAS, WHY START WITH THE YEAR 2000? In October 2000, Cathie Black, the former Hearst Magazines President, was quoted at the AMC Conference by the New Single Copy. She said: “[the industry must] make sure we really understand scan-based trading (“SBT”) before we implement it, and make sure that the system accepts new products.” The publishing industry has been stuck in this same operational morass for more than 4,500 days. The leaders of this industry should be embarrassed that this is still an issue. WHY ARE YOU COMPARING PRINT TO ELECTRONICS? I want publishers to focus on the concept of competition. For example, the Blackberry was an unrivaled success, and then competitors duplicated and enhanced similar products for customer satisfaction. 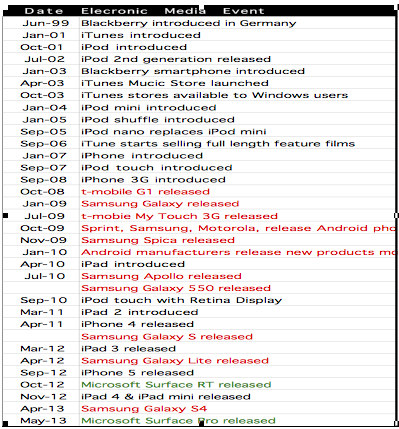 Apple’s iPod and iPhone were unrivaled before Google Android and Samsung became power players. In this competitive set, each company tries to grow their business by outperforming each other. WHAT ARE YOU ADDRESSING TODAY? Publishers should ask its newsstand leadership, its wholesalers, and its consultants how they have tried to outperform each other at retail in the past two decades. Publishers are not going to like the answers they receive because they will hear a series of industry platitudes and excuses. In the 1990s, publishers were told sales declines were caused by the expansion of gum, candy, salty snacks, and soda coolers at checkouts. The industry response was to defend checkout space by raising cover prices and paying more for checkout space in the form of higher placement fees. The result: even more sales erosion. The 2000s brought us 9/11 in the first half of the decade and a recession in the second. The publisher response again was to pay higher fees to maintain the ever-shrinking checkout space. But two important events conspired against raising prices to offset these fees. It is impossible to raise prices in a severe recession. Also, because publishers initially embraced free internet content, it is equally difficult to raise cover prices; therefore the industry is in more peril today than ever before. THIS IS NOT REALLY A FAIR COMPARISON – ELECTRONICS BECAME UBIQUITOUS AND PRINT, IN SOME PEOPLE’S MIND, IS DYING! I can point out a print industry that is doing anything but dying: Diamond Comic Distributors is the sole distributor of comics to comic shops in the United States and Canada. I was privileged to work with them from 2011 – 2013, and they taught me a great deal about the publisher/distributor/retailer relationship. The symbiotic relationship reinvigorated the comic book industry after the 2008 recession, the same time magazine sales continued to decline. Below, is a chart of comic retail sales by month dating back to 1999. I want to thank The Comic Chronicles for their work reporting data to the comic industry. This, and many more reports, are found at their website http://www.comicchron.com. The chart makes three points. 1) While there was a small decline after 9/11, sales resumed their normal pace quickly thereafter. 2) Comic sales were hurt as badly as magazines from mid-2009 through mid–2011. 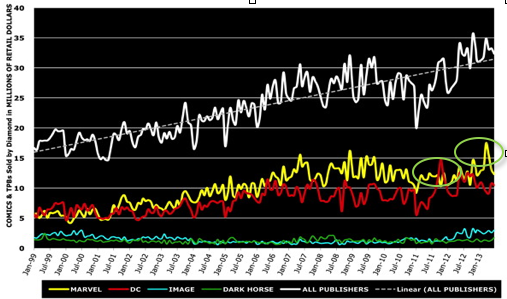 3) Look at the sharp increase in DC Comics sales (red) in late 2011, and the Marvel Comics sales spike (yellow) in 2012. I highlighted the growth in with green circles. WHY DID DC SALES SPIKE? ONE EDITORIAL CHANGE CAUSED SUCH A BIG SPIKE? Partially. The second largest comic publisher developed a revolutionary new concept and, working hand-in-hand with Diamond Comic Distributors, successfully rolled out the biggest thing in comics flawlessly. I was working on other projects for Diamond, but I witnessed remarkable competency from both companies. WHAT HAPPENED WITH MARVEL IN LATE 2012? Marvel NOW! was a relaunch of the Marvel comic line. Marvel editor-in-chief Axel Alonso differentiated Marvel NOW! from DC Comics’ in an interview with Entertainment Weekly. “This ain’t a reboot. It’s a new beginning…every week you can go into a comic book store and find a few new jumping-on points for the Marvel Universe, a place you’re going to like visiting. Or revisiting.” (http://popwatch.ew.com/2012/07/03/marvel-now-jean-grey-exclusive/). HOW DO YOU RELATE THIS TO MAGAZINES? First, let me pose a question to you: can you think of the last major change in the magazine business where a publisher worked closely with its national distributor, its consultant and its wholesaler to make a positive difference in existing titles? You will be hard pressed to come up with one. Second, and I will elaborate on this in upcoming sessions: the current level of distrust and animosity between supply chain “partners” guarantees that nothing like the Diamond/DC and Marvel success will ever happen unless major changes come to pass. ARE MAGAZINE PUBLISHERS OUT OF IDEAS? No. Think of your roundtable meeting with the CEOs at PBAA. The major publisher CEOs have great ideas and want to implement them. Smaller publishers are coming out with new products all the time and are looking to expand distribution and have ideas of their own. SO WHERE IS THE EPICENTER OF THE PROBLEM? Publishers are, without question, the second-most important player in the magazine supply chain behind the retailer. Due to a series of unwise business decisions, publishers ceded their authority to consultants, national distributors, wholesalers and a myriad of other middlemen. Each one of these middlemen have different agendas, so any major change is blocked, delayed or just killed in the gauntlet set up by these entities. 1.) Which of these groups are part of my supply chain? 2.) What purpose does each entity serve? 3.) How much do we pay each group? 4.) What is the publisher’s profitability after paying for three, four, five, six or seven agents? 5.) Have there been times publisher proposed a marketing plan but was prevented by any of the entities other than the retailer? 6.) Was the negative response plausible to the publisher? 7.) Does my publisher consultant and national distributor prioritize my business, and are they working in a way that makes me most profitable? This is just the beginning, Luke Magerko has still plenty to say in this continuing, yet very important saga of the American Newsstands… Stay Tuned. Matt Bean, SI.com managing editor, was my guest on a panel about Sports in a Digital Age at the annual convention of the Association for Educators in Journalism and Mass Communication in Washington, D.C. After the panel I asked Matt a question about the secrets of success of SI.com and how he thinks the integration between Sports Illustrated, the print weekly, and its digital counterpart, SI.com, is going. You are currently browsing the Mr. Magazine blog archives for August, 2013.